Bringing together valley organizations that support growing, eating and buying local food is more than a movement, it's a lifestyle. Information about how to synthesize local food into a diet, how to grow food and where to buy fresh local food products has been gathered together in an informative pamphlet created by Idaho's Bounty Communications Manager Laura Theis. Theis created the pamphlet for valley residents and visitors to enjoy fresh and locally grown food. Her work gathering information culminated in an event calendar that includes the Idaho's Bounty Locavore Restaurant Festival, the Sawtooth Botanical Garden's locavore series, gardening classes and events hosted by the Hunger Coalition nonprofit group, Glow café in Ketchum, NourishMe retail store in Ketchum, and the Wood River Sustainability Center, an outlet for local products in Hailey. In addition, the brochure includes resource listings on restaurants and businesses that sell or cook with local food, including summer farmers markets in Ketchum and Hailey. "The hope is the valley will become known as a place for local food," Theis said. "With so many options, this is a resource for people to know where to eat and shop." Theis has been with Idaho's Bounty since its online cooperative food market began in October 2007. She said working together helps farmers—75 percent of the organization's sales go back to the farmer. "It helps to know about our resources because we live in a remote place," she said. "We can't always have access to certain foods." Pamphlets are available at all of the listed businesses, restaurants and organizations. Theis said she hopes to have them available at additional businesses and community centers around the valley for the summer. Molly Peppo Brown, owner of Glow Live Food Café, said a goal of providing information is to let people know what can be grown or obtained locally and what has to be imported. "Learning what to store in the winter and what to grow in season is [also] important," she said. Brown's café uses all-organic, non-GMO produce, nuts and seeds. The philosophy behind Glow is a better life through nutrient-dense, sustainable food. "Growing one's own food is the safest," she said. "Everything has to be taken into consideration when there is radiation, food sources are weak and there is an increase in pollution." Brown offers cleanses three times a year to promote food education, health and well-being. 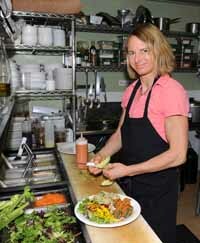 She is organizing a Community Cleanse from May 9-13 to help the body rid toxins for optimal health. She said the cleanse is ideal for anyone who would like to improve his or her health, increase body awareness, lose weight, clear pain and inflammation or relieve chronic conditions, allergies, asthma, constipation or dehydration. "It's for everybody," she said. "Cleansing is more powerful with a group and with the support of [knowledgeable] practitioners. It can be euphoric and life changing. The benefits can last from three to six months." Brown said she wants these ideas integrated in as many lives as possible, especially since the valley will host to the Sun Valley Wellness Festival from May 27-30 at the Sun Valley Resort. "Everyone is passionate in their individual way," she said. "Increasing food and body awareness is the goal." With like-minded businesses all coming together to help promote sustainability, local resources and businesses, the valley can provide an increase in healthy living options and the quality of food available.